The Yorkie Angel Patrol is a non-profit 501 (c) (3) organization comprised of dedicated people who are concerned with diseases that primarily affect the toy dog breeds. Our mission is to provide general information on the toy dog breed and help pet owners with questions concerning genetic diseases and assist them in finding the right resources. One of our goals is to provide individuals with the tools they need to make wise decisions regarding the money they donate to charities and to help these individuals ensure that their donations are used properly. We are also dedicated to raising money in support of the University of Tennessee Angel Fund (Liver Shunts) , the University of Tennessee Fancy Fund (Collapsing Trachea), and the North Carolina State University CREATE Fund (GME). Your donations to the Yorkie Angel Patrol are tax deductible. 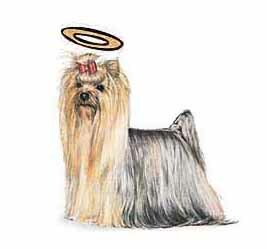 The Yorkie Angel Patrol Chat is a group for people who are owned and loved by toy dogs. It is a place to share stories, prayers, and to work together to help stamp out the genetic diseases in the toy dog breed. We are a 501c organization dedicated to raising money for the University of Tennessee Angel Fund (Liver Shunts), the Fancy Fund (Collapsing Trachea) and North Carolina State University CREATE Fund (GME). Anyone who is interested in these diseases and interested in supporting our fund raising efforts is welcome to join. All we ask is that there be no flaming, no selling of puppies, no solicitations for personal businesses or other causes without prior approval from moderators, and to treat each other with respect and courtesy. We will need your full name, address, phone number and email address. This information will be held confidential. The purpose for collecting this information is to prevent people from signing on with false credentials.